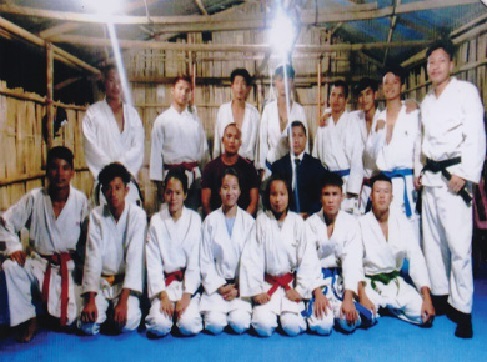 The Arunachal Wado Karate Do Association (AWKA) has selected 18 players for the 3rd Wado National Karate Championship 2018, which is to be held at Vadodara in Gujarat, from July 6 to 8 next. Addressing the team briefing session, AWKDA general secretary Sensei Nanu Sangha advised the karatekas to maintain strict discipline on and off the field. He told the players that apart from good health and sound mind, dedication, determination and self-confidence are needed to excel in sports. Taba Nyokum, Likha Dol, Taj Aku, Niya Tao, Neta Menjo, Likha Lej, Gollo John, David Rijiju, Tarh Eliya, Nongchen Hodong, Likha Oum, and Chuku Saha (Male); Tao Aman, Tao Lushi, Tao Yajo, Desa Sikum, Tap Menia, and Yapung Sonam (Female). The team will play in both kata and kumite categories. Likha Lej and David Rijiju are the coaches, while Nongchen Hodong and Gollo John are the team managers.